Mushroom soup recipes make proven anti cancer food. 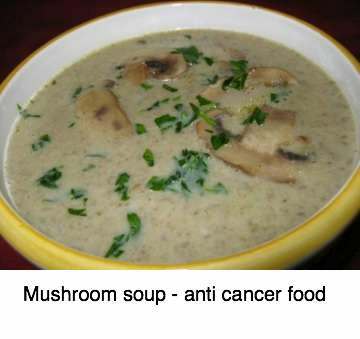 Mushroom soup recipes make scientifically proven anti cancer food. Personally I'm crazy about soups, particularly those made with mushrooms. It's so easy to cook, delicious, and you can get a whole meal in one. This makes one of my favourites. It's low in calories, depending on how much cream you add, high in nutrition, particularly that elusive antioxidant selenium that has been shown to be a wonder mineral and quite hard to get in your diet, and the essential B complex vitamins. Do you know the four important vitamins that stop the progression of frailty syndrome, the relentless march to disability, pain and loss of vitality? Your mushroom soup recipes are rich in three of them. If you have read other pages on this site, you will know that I hate exactly prescribed recipes. This one is no different; add a bit of this and that, exploring your creative side. They go particularly well with fowl so, if you aren't a vegetarian, I suggest you start by making up our easy chicken bones stock. The alternative is cubes that have nasty chemical preservatives and that really defeats the whole purpose of making anti cancer mushroom soup recipes. Just buy a packet soup if you're planning to add cubes. CHICKEN BONES bouillon ... proven powerful anti-arthritic properties. This page was last updated by Dr Barrie Lewis on 28th December, 2018. Healthy slow food, made fast, is our theme song; mushroom soup recipes are amongst the easiest. It's serious anti cancer food, yet tastes wonderful. Mushroom soup recipes that you can prepare in half an hour if your chicken bones bouillon is ready frozen. A large punnet of mushrooms. 1 cup of milk, or double-thick cream, if you like it creamy and disgustingly delicious. Let your imagination run wild! Increase the nutritional value of mushrooms soup. Any herbs (like a bayleaf, thyme, parsley) and spices you like, but remember that the mushroom flavour is delicate. Don't drown it. To about a litre of your hot, strained Chicken bones broth add the chopped potato and carrot and bayleaf. Simmer gently for twenty minutes. Near the end add the optional chopped stick of celery. Scoop the mushrooms and all the butter into the potato-chicken-bones bouillon mix, boil for another ten minutes. 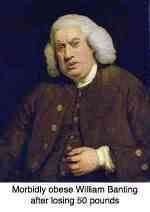 Remove the bayleaf and add a slosh of port (or sherry) if your cholesterol is high and you don't have gout. Partially liquidise to the consistency you like, and bring back to the boil. Add the milk (cream), salt and pepper, your favourite herbs and another clove of garlic (or three!) and simmer until you cannot resist the smell any longer! About one minute. Sprinkle with a little finely chopped parsley. Mushrooms are well known for their anti-cancer properties and their selenium-rich content. Men with low selenium are prone to that highly aggressive, most humiliating of diseases... NUTRITIONAL VALUE OF MUSHROOMS. Prostate cancer is the number one fatal male cancer; metastases to the spine and pelvis are not uncommon; hence the interest of every chiropractor. And our mushroom soup recipe is part of the solution. The other part is a tomato a day; there's strong research showing that it reduces prostate cancer by fifty percent. A drug that did that would be considered a wonder medication, and every male would be paying a fortune for it every single day; instead, you can have it fore the price of just one fruit. Every man shall enjoy a tomato a day, and it's perhaps even better cooked. Consider our tomato soup recipe twice a week, and dark green leafy salad with one of the bright red, lycopene rich fruits on the other days. Few things are more important in the human diet, remembering that along with prostate cancer lurks impotence and incontinence; such a simple solution and it's astonishing how many men ignore it; prostate cancer only happens to other women's husbands. Now this is important. Vitamin E comes in several different forms. Those most commonly researched are called alpha and gamma tocopherol. Most supplements of vitamin E contain only alpha tocopherol resourced from wheat germ oil. Please check the bottle; it's vitally important. Why, you may ask? Research in the so called SELECT trial shows that if you are taking supplements with only the alpha form of tocopherol then you don't get the protection that selenium gives against prostate cancer. It's the gamma tocopherol that gives protection, and the alpha vitamin E blocks those sites, actually increasing the risk of prostate cancer. Once again, nature in her wisdom shuffles these minerals and vitamins up in the right mix. Don't expect to get all your selenium and vitamin E out of a bottle; rather enjoy them from foods rich in these nutrients. Foods like mushroom soup recipes! Eat a good diet, from as wide a source of foods as possible, and at least eight colours per day. Don't get neurotic worrying about quantities. AVOCADO FAT has a good mix of alpha and gamma vitamin E. Selenium too. Every single chiropractor is faced daily with male patients suffering from lower back and pelvic pain; could it be prostate cancer? Not if you're enjoying tomatoes and mushroom soup recipes regularly. And these mushroom soup recipes provide three of the four vitamins needed to prevent frailty syndrome.